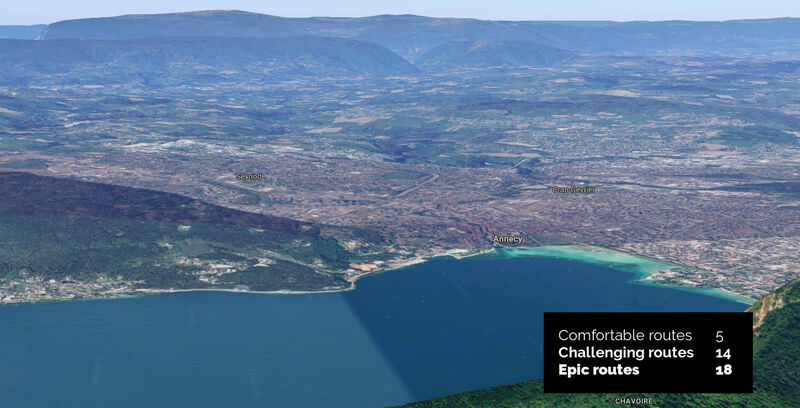 Each cycling route during your Annecy Bike Tour will be tailored specifically for your bike riding ability and experience, with an endless choice of rides in Annecy you can have a challenging ride or a comfortable ride, the choice is yours! Sports drinks and nutritional supplies are always on hand to keep the legs turning as well as mechanical and first-aid support for any unforeseen occasion. The Practice Bicycle team have a world of cycling experience available to you, allowing each ride to be perfectly paced so you can appreciate the scenery, take some photos or if you wish to be challenged take on another climb or two! These are just some of the 100+ exclusive rides in Annecy available to you during your bike trip! One of the many pleasures of riding in ‘Cycling Paradise’ is the opportunity to explore in all directions. Today is the tranquillity of the French country lanes as we explore to the West of Annecy amongst traditional tiny villages and away from the Grand Alps. This perfect ride show cases the rolling green fields of France with the Semnoz Mountain Forrest and the spectacular jagged silhouette of the French Alps for the backdrop. There is always the perfect opportunity for a refreshing break in a picture postcard setting, why not a classic French Midday lunch in the country! Feeling hungry? The legs must surely be hungry? This special little village in the Haute Savoie countryside provides fantastic cuisine…It’s just around the corner with Practice Bicycle Bike Tours! What an ideal way to spend the day who would have thought a bike tour to the French Alps could be this great with the best guided riding in the world stress free! One of our favourite areas awaits you today and one that we could spend all week exploring together, popular in winter with the skiing fraternity, just as breathtakingly peaceful in summer by bike. We head South out of Annecy and into the Park Massif des Bauges region, this area has a wonderful network and choice of quiet valley roads available to you, all with amazing different scenery. Take your pick of cycling at its very best and work up an appetite for a lunch stop in our village ‘local’! A must try is Mark’s chocolate éclair or if you have a more savoury palate…Tome des Bauges Fromage – A unique cheese which comes from local dialect ‘toma’ meaning cheese made in mountain pastures, produced in the Regional Natural Park of the Bauges Mountain. It’s then a beautiful gentle descent back into Annecy with amazing views of the lake and Alps around each corner, the perfect photo opportunity! 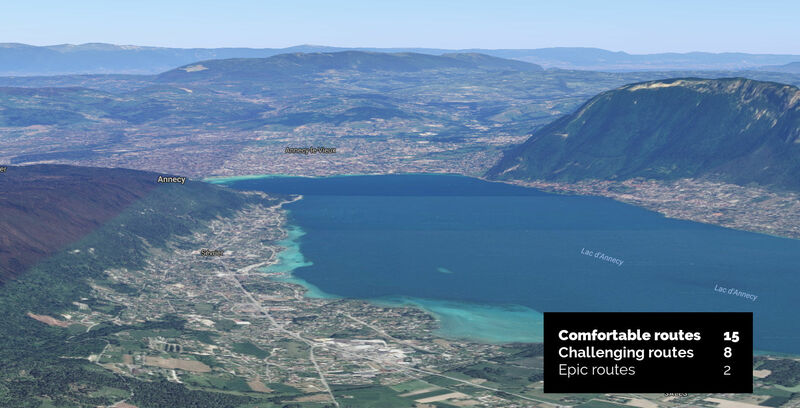 After many years living, preparing for major races and riding from the home of PRACTICEBICYCLE here in Annecy, we are always spoilt for choice when it comes to picking and tailoring your great ride routes in and around the French Alps during your stay with us. This is one of the Teams local challenges into the Grand Alps, we have many Col’s of varying difficulties and duration accessible from Annecy and the clear blue waters of the edge of the Lake, but the Aravis Mountain range is one of the most spectacular and on a clear day you will see Mt Blanc (4810m) the White Mountain and highest peak in Europe. It’s a challenging ride but the spectacular views and sense of achievement as you reach the summit of the Col des Aravis (19km @ Average 5%, 1498m Altitude) make it well worthwhile. Passing along the deep valley floor it’s not long before we start our long gradual climb deep into the high Alps amongst the shimmering peaks and the fresh mountain air, with breathtaking scenery every pedal stroke of the way. No visit to Annecy would be complete without a breathtaking loop around Lake Annecy, the cleanest Lake in Europe. The ‘Pearl in the box ‘surrounded by the Forrest mountain of Semnoz on the west and the massive La Tournette (2351m) and the Grand Alps to the east. Leaving Annecy Centre Ville at a leisurely pace, starting with the bike path, this converted railway line makes for perfect photo opportunities on route; it’s not long before we are following the contour of the Lake. Exploring the tiny labyrinth of streets and passing homes from medieval times, contrasting spectacular views every few minutes as we head to the southern end of the lake. It’s easy to see why we like to take in this gentle ride…..so much to see in such a short period of time! With the perfect break by the side of the Turquoise Waters’ of Lake Annecy and a french restaurant lunch experience to remember. This bike tour is one of the favorites including the climb of the Col du Marais, this challenge with its constant grade and relatively short duration makes it a French Alps pleasure for all! 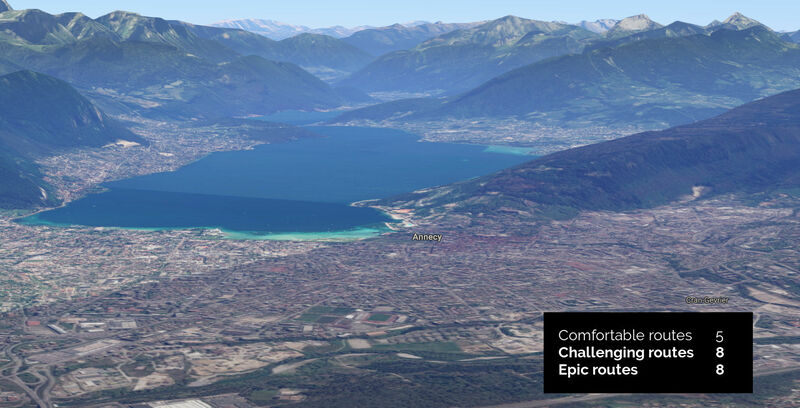 This route like many of these amazing rides can be ridden from a variety of directions, we will head south down the valley following the side of Lake Annecy. 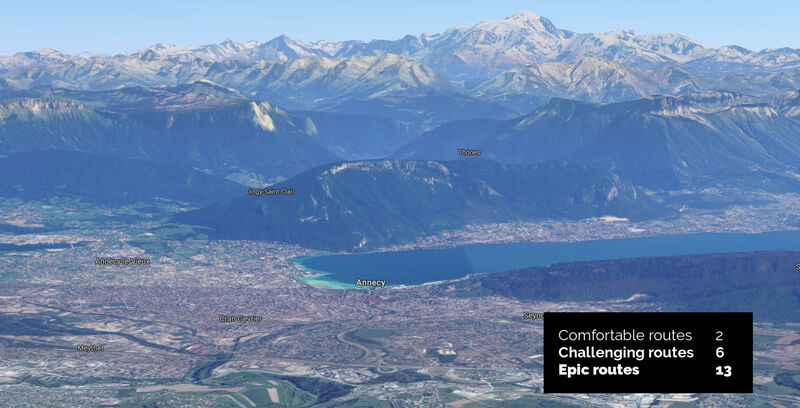 Ready to take on your own French Alps at your pace with the slopes of the Col du Marais (10km @ Average 4%, 843m Altitude), the air is fresh and the views are magnificent and you will experience for yourself why the French Alps are world famous! Your little taste of the grandeur of the Alps continues descending through the village of Thones, a beautiful town and the center of the famous local “Reblochon” cheese production industry. With all this cycling effort there is always a reward and today is no different at one of our star restaurants on the edge of Annecy as we enjoy lunch together to cap off a great day of cycling in Annecy the French Alps! Enjoy the remarkable contrast of this cycling paradise as we explore some of the flatter roads to the West of Annecy and away from the Grand Alps. After a gentle climb out of town it’s not long before we are rolling amongst the picture postcard undulating French countryside and heading into the next valley. Dotted with tiny villages and local vineyards as we enjoy the quite open roads with views all the way and a café stop never far away! This neighbouring valley has the huge water catchment area of Lac du Bourget the largest lake in France with the tranquillity of its adjoining Canals ideal for a relaxing lunch time refreshment. The shore line of the lake is great cycling and for the more adventurous amongst us a little detour for that additional challenge is available on the way home, should you wish! Undulating roads across authentic France, fantastic views all the way. Ride into the heart of some of Frances best fruit growing country, especially for apples and pears. Our Annecy bike trip combines the best cycling in the world with a stay in one of France’s most beautiful towns. Discover the perfect balance of riding and relaxation in a true cycling paradise.